When your child starts or returns to school, it can bring up some BIG feelings! For them, and for us! If they’ve just started, they are probably in overwhelm, and if they are really happy to be back, there can still be an adjustment period of being back in that environment with teachers, lessons & friendship dynamics. 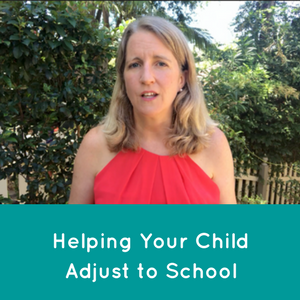 So this week’s video is about how to best help your child and deal with the fall out of a busy school day when they return home to you. Firstly – expect some off track behaviour. Your child might be hyper, withdrawn, angry, belligerent, uncooperative, etc, etc. So allow them to have their feelings. Recognise that there will be a really valid reason driving the behaviour and, especially in the case of anger or frustration, there is often hurt or sadness underneath. Secondly – decipher the code… If your child suddenly becomes irate over the tiniest thing, or unreasonable in their requests, recognise that this is code for a bigger hurt or feeling. They will latch onto something tangible – like you’ve played the wrong song, you “don’t have anything nice to eat” or they urgently demand their brother’s toy – and their pent up upset feelings from the day will come out in an explosion over that particular thing. Know that there is something bigger going on here that your child needs help with. So how can you best reach & help your child? Don’t be afraid of their big feelings. Try to hold the space for them to come out & listen as much as you can. Set a loving limit, offer empathy & be with them in all of their fury & upset. If you don’t feel you can quite reach them – your usually loving & open child is now a bit sullen & uncommunicative – offer Play. Pillow fights or rough & tumble play is fantastic for helping release feelings of frustration or powerlessness with you. WANT MORE INFO & SUPPORT? WAITLIST now for the next live round of ANNOYING to AMAZING – my 8 week online course to help you Transform Your Everyday Parenting Challenges. If you’d like more personalised support, CLICK HERE to book a private consultation.